AKIPRESS.COM - Ambassador of the United States to Turkmenistan Allan Mustard led an excursion to the Dayahatyn Caravanserai for members of the local diplomatic corps on November 1. 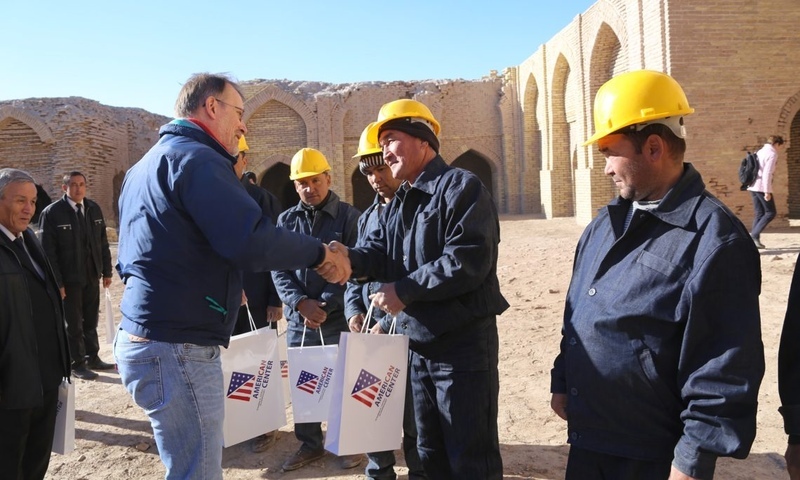 The purpose of the visit was to examine progress of a cultural preservation project funded through the U.S. Department of State Ambassadors Fund for Cultural Preservation (AFCP). Members of the diplomatic corps enjoyed a guided excursion through the ancient complex and learned more about the government of Turkmenistan’s efforts to restore and preserve numerous sites along the Great Silk Road. The excursion was organized with the support of the government of Turkmenistan’s Ministry of Culture and Ministry of Foreign Affairs, the U.S Embassy said. The Dayahatyn Caravanserai project is funded through the U.S. Department of State Ambassadors Fund for Cultural Preservation (AFCP), in the spirit of bilateral cultural cooperation. Conducted in two phases, the project aims to stabilize and document all aspects of the site, through the restoration of its walls, arches, domes, and ornamentation, laying the groundwork for greater tourism. Phase I of the project ran from 2012 and 2016; Phase II began in 2017, funding work that will continue through 2019. Since 2001, Turkmenistan has received 25 AFCP grants, tying with Peru for the highest number of AFCP projects in the world. These grants, totaling $1.5 million, have supported research, documentation, and preservation efforts of historically significant sites, objects, and cultural traditions, including at two UNESCO World Heritage sites. A strategic stop along the legendary Silk Road, the 12th-century Dayahatyn Caravanserai is one of the best preserved caravanserais in Central Asia, dating back to a period of intensive trade between East and West. It is located approximately 170 kilometers northwest of the city of Turkmenabat, in Lebap province. Its fortress walls measure 53 meters in length on each side, featuring intricate, Seljuk-style brickwork. Its unique architecture appears on the cover of a new book, Where the Caravans Roamed: The Silk Road in Central Asia, funded by the U.S. Department of State and published by the U.S. Embassy in Ashgabat. The book features photographs of Central Asian Silk Road landscapes and monuments, taken by American landscape photographer Tom Till.